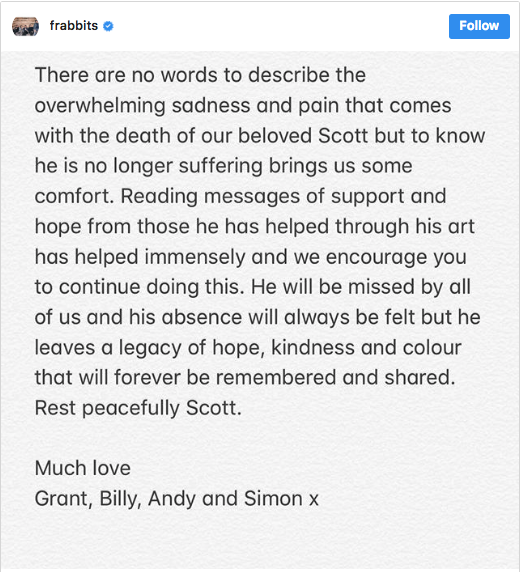 Frightened Rabbit lead singer Scott Hutchison has been confirmed dead after reports came Wednesday that he had gone missing. His body was found at the Port Edgar marina near South Queensferry in his native Scotland. He was 36. Hutchison first began using the Frightened Rabbit moniker in 2003, deriving it from a childhood nickname gave to him by his mother because of his chronic shyness. Frightened Rabbit started out as a solo project for Hutchinson and slowly accrued members over the years – first with his brother Grant Hutchison on drums and then with Billy Kennedy on guitar in 2006. The same year Kennedy joined the project coincided with the band’s first album, Sing The Greys. The 2008 release of their sophomore album The Midnight Organ Fight” saw the band finding international success propelled by future signature tracks like “The Modern Leper” and “Keep Yourself Warm” and lead to a tour with Death Cab For Cutie. The band would release five albums, with their last album Painting of a Panic Attack arriving in 2016. Mental health, depression, and anxiety were prominent themes throughout Hutchison’s work both in Frightened Rabbit and with his solo project Owl John and in the group Mastersystem (who just released their debut album Dance Music last month). One of the key figures in a wave of Scottish rock bands in the 2000s whose bombast often matched their emotionally charged lyrics, Hutchison’s legacy is that of a songwriter who was unflinching with his visceral lyricism and powerful, booming chords that exposed the inner struggles he dealt with and, in the process, connecting with fans across the globe who were battling similar issues. Hutchison and his brother were also supporters of Cystinosis Foundation UK, an organization battling a rare disease found in newborns. Hutchison stopped through KEXP eight times between 2008 and 2016, including one as Owl John. We’ve been honored to have him in our space and share his music. Join us in remembering his legacy and revisiting some of those session below. In these disastrous times, disastrous times"